Wigs and Warpaint is Sheffield’s largest salon. With 35 staff members, there are a variety of skills, talents and creative passions flowing throughout, visible in hair and beauty services alike. Every year, Wigs and Warpaint take part in many photoshoots and fashion events, showcasing their abundance of talent to the public as well as to people ‘in the know’. It’s vibrant, retro-styled and thanks to its location means that you can show off your new look as soon as you walk out of the door. Open six days a week, if you are in need of some TLC, then why not book an appointment and head to West One, in Sheffield City Centre and treat yourself – after all, you deserve it! 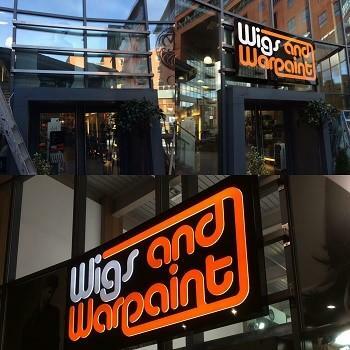 Our latest retail sign instalment has been a CNC routered sign for Wigs and Warpaint – a talented array of hairdressers who reside at West One in Sheffield City Centre. For them, we have created a fret cut sign tray with 12mm Perspex letter inserts which we illuminated by using white LEDs. We then fitted the sign using three brushed stainless steel rails to create the desired look. CNC routered signs use state of the art technology in order to give your sign a professional, flawless and perfect finish. It’s an incredibly accurate method of sign creation, as it gains greater precision than any human hand-eye coordination could, helping you to create the best of first impressions. The CNC machine can work its magic on an array of materials of your choice, including aluminium, plastic, wood or Perspex, like Wigs and Warpaint have used. All we need is your chosen design and you can leave the rest to us…or should we say, our CNC machine? !